We at Carbonyte Systems Inc. are dedicated to providing our customers with the best service, quality materials and equipment at fair and marketable prices while continuing to improve on the current technologies. We are constantly striving to improve the Pavement Maintenance Industry with innovative design and application while also being considerate of the environment in which we all live. We use the most sophisticated equipment and experienced personnel to develop and expand the latest technologies in and outside the pavement industry. The Space Travel industry brought an excitingly innovative and new technology called the “Carbonyte Process™.” As we continue to develop the technology of the Carbonyte Process™, we continue to look for other technologies and resources that can benefit the pavement industry. Bituminous asphalt, a byproduct of the distillation of crude oil, is the most widely utilized adhesive on earth. Worldwide, commercial applications annually consume in excess of sixty million short tons (60,000,000 tons); with over eighty five percent (85%) being applied in road surfacing system. A polymer additive system is now available, which economically converts asphalt into a superior performing thermoplastic. 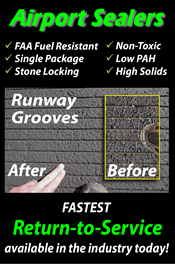 The asphalt, polymer additive innovation is referred to as the Carbonyte Process™. The technology is derived from a decade of vigorous, polymer science research and team development within the Lockheed Martin* Missiles and Space Company. Asphalt is essentially a waste byproduct of the cracking and distillation process of crude oil. Depending upon which of the more valuable hydrocarbon petrochemicals were extracted from the column as the oil was fractionated the remaining asphalt physical and chemical properties may exhibit broad variability. The Visco-elastic, physical characteristics of asphalt, i.e. glass transition temperature, softening point, resistance to penetration and rheology under shear are all ultimately dependent upon the constituent molecular structure(s) remaining after distillation. 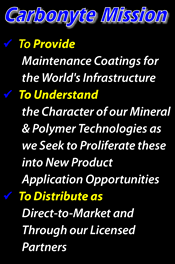 The Carbonyte Process™ embodies the incorporation of complex, reactive synthetic minerals, generally at loadings of less than one percent (1%), into the bituminous asphalt resin. A critical first stop in the process is to perform a Molecular Asphalt Analysis (MAP). The MAP process identifies important intermolecular relationships within the neat asphalt resin; relationships which are always peculiar to: 1) the region from which the original crude oil was pumped and, 2) the distillation protocol utilized at the refinery. Once profiled, a custom configured polymer additive is prescribed for the asphalt which will achieve the most ideal, ultimate end use upgrades. Typically the Carbonyte Process™, which modifies carbon-carbon bonds within the asphalt, will substantially improve the asphalt's ductility, raise its softening point, increases adhesion to mineral surfaces; and, in the case of emulsions, render the cured film completely insoluble with a notable reduction in coating cure rates. Using the Carbonyte Process™ will assure longer lasting, improved hot and cold weather Performance for roofing, waterproofing and road binder asphalts.